Duo Country US originaire de Caroline du Nord. Bill Bolick (né le 28 Octobre 1917) et Earl Bolick (né le 16 Novembre 1919, décédé le 19 Avril 1978), les Blue Sky Boys, très populaire durant les années quarante, se retirèrent du Show Business en 1976. In the '30s, brother duos were common in country music: Among the better known were the Monroes, the Delmores, the Dixons, and the Carlisles. Bill and Earl Bolick, who in 1936 were ready to make their first recording, followed their producer's suggestion that they should be different by avoiding the word "brother." From "Blue Ridge Mountains, Land of the Sky" they took two words and named their act. But the Bolicks would have been different without the new name. Their intricate yet simple harmonies, their perfectly matching voices, and their unadorned mandolin and guitar instrumental backing set them off from the competition, so much so that two generations of subsequent duo singers echo them, some without realizing it. The Everly Brothers and the Louvin Brothers, themselves recognized as exceptional Vocals duos, acknowledge the influence of the Blue Sky Boys. In the '50s, when tastes in country music changed drastically, the Blue Sky Boys retired from music rather than forsake their love of old mountain ballads for the uptempo popularity of electric instruments, drums, and honky tonk. In the '60s they were coaxed to come out of retirement, playing an occasional college date during the hootenanny phenomenon and recording albums in 1963, 1965, and 1976. Born and raised in East Hickory, NC, Bill and Earl Bolick — the fourth and fifth of six children by deeply religious parents — learned how to harmonize by singing hymns and gospel songs at home. Bill learned how to play guitar and banjo from his neighbor, teaching Earl in the process. 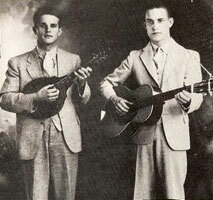 Earl had been given a mandolin, but he preferred guitar, so the two brothers switched instruments and began performing as a duo. Bill also performed with another local group, the Crazy Hickory Nuts, who happened to land a radio spot in Asheville, NC, in 1935. Shortly afterward, the siblings formed the JFG Coffee Boys with Homer Sherrill, a fiddler who played with the Crazy Hickory Nuts, and the new group also had a regular spot on Asheville radio. The group stayed in Asheville for a while, before moving to Atlanta to play as the Blue Ridge Hillbillies. 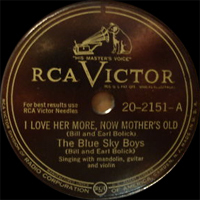 While in Atlanta, the Bolicks split away from Sherrill and recorded several sides for RCA Victor, which were released under the name the Blue Sky Boys. Over the next four years, the Blue Sky Boys made nearly 100 recordings for RCA that made them one of the more popular brother duos of the period. The Bolicks' career was sidetracked in 1941, when the brothers both entered the military to fight in World War II. Early in 1946, they were discharged, and they returned to playing radio in Atlanta and recording for RCA. Occasionally, the duo recorded with a fiddler, usually Sam "Curley" Parker, Joe Tyson, Leslie Keith, or Richard "Red" Hicks. Many of the records from 1946 and 1947, including "Kentucky," ranked among their biggest hits, but by the end of 1947 the duo was growing frustrated at the changing climates in country music and their record label as well. Honky tonk music was beginning to take over the country market, and the Bolicks refused to bend to fit into the new instrumental style. RCA asked them to add an electric guitar and try some newer songs, but they steadfastly refused and didn't even record until 1949. Over the course of the next year, they made a handful of recordings, performing their final sessions for RCA in the spring of 1950. Given their frustrations about the changes in country music, the Blue Sky Boys disbanded and retired from music in 1951. For the next 11 years, they were silent, with Bill living and working for the post office in North Carolina and Earl making his residence in Georgia, working at Lockheed Aircraft. 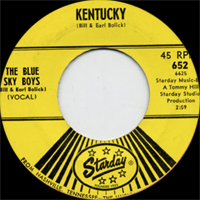 Starday Records released an album of Blue Sky Boys radio transcriptions in 1962. The following year, Bill convinced Earl to come out of retirement and record two albums, the secular Together Again and the inspirational Precious Moments, for Starday. Over the next few years, they played the occasional concert and appeared at folk festivals. In 1965, Capitol released a live album capturing the duo at the UCLA Folk Festival. By the end of the '60s, the Blue Sky Boys had retired again. In 1975, the Bolicks were coaxed out of retirement to record an album for Rounder and play several bluegrass and folk festivals. Shortly afterward, Bill retired and moved back to his hometown of East Hickory, while Earl settled in Tucker, GA.
No one in country music has done Vocals duos better than the Blue Sky Boys. If your taste runs more to Conway and Loretta, George and Tammy, or Wynonna and Naomi, listen to the effortless, exquisite singing of Bill and Earl Bolick. See where it all started.